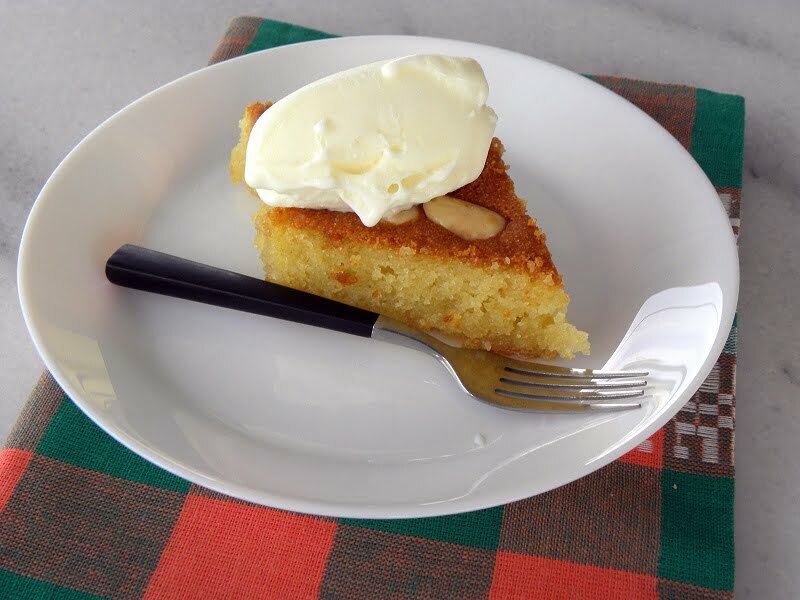 Kalon Prama, which is the Cypriot name for Samali, is a moist, eggless, semolina cake, made with sheep’s milk yoghurt, flavoured with mastic and bathed in syrup. The word “kalon prama”, means “Nice Thing” or “Good Stuff” and is the Cypriot name of this cake. I was meaning to make this dessert for a long time now and there are a lot of Cypriot recipes I have still to record, so I kept postponing it, as I was making new recipes. A few days ago we went shopping with my husband and saw some sheep’s yoghurt. I immediately remembered the yoghurt my father used to bring at home and without second thought I put it in the cart. I hadn’t eaten sheep’s yoghurt since I left Cyprus and I had forgotten what a wonderful taste it has. This yoghurt was in a 1 kilo earthenware dish and it was too much for us to consume in a short time, so the first thing that came to my mind was to make Kalon Prama. Although I have been in Greece for so many years I never had this dessert in any friends’ or relatives’ house before. I had bought it, however, from bakeries, supermarkets and confectioneries, but whenever I tried it, it was nothing extraordinary. I’ve had this recipe since I was single after eating it at my aunt Loukia’s house. I loved this dessert, so I asked her for the recipe. Her house was near the Central Market, which was called “Pantopoleio”. At the time I used to work near the central Post Office, which was not far from her house. She would occationally, call me and invite me over for lunch. As her daughter, my cousin, was about my age and we were good friends, I would always accept her invitation because apart from being very pleasant and easy to converse with, I loved her very much. She was a great cook but at that time, although I loved cooking, I did not ask her for any recipes except for this one. So you can imagine how delicious it was!! Whenever I bake this cake, I remember my aunt Lukia and remembering her, brings back so many fond memories. Kalon Prama, which is the Cypriot name for Samali, is a moist, eggless, semolina cake, made with sheeps' yoghurt, flavoured with mastic and bathed in syrup. Prepare the syrup: Put the sugar, water and lemon peel in a pot and mix to dissolve the sugar. Bring to a boil and cook for 5 minutes. Add the lemon juice and remove from the heat. Preheat the oven to 180o C/ 350o F.
Pound the mastic resins with 2 teaspoons of sugar either with a pestle and mortar or in a spice grinder. Beat the yoghurt and sugar in the mixer at full speed for 15 minutes. Mix the semolina with the baking soda and mastic and mix to combine. Reduce the speed of the mixer to low and add the dry ingredients gradually. The mixture must be denser than a cake. Brush the baking tin with tahini or honey-tahini. Empty the mixture into the baking tin and spread it evenly with a spatula or a spoon. Score the pieces with a knife, as a guide, to insert the almonds. Decorate with the blanched almonds. Bake for about 45 minutes to 50 minutes, depending on your oven, or until a knife comes out clean. Pour the syrup, which must be lukewarm or cold, over the hot cake. Wet it slowly, a spoonful at a time, so that it may be absorbed by the cake. Cover with a clean napkin and leave it to cool or until the syrup is absorbed. Cut the cake into diamond pieces or any other shape you like. Serve with kaimaki or other ice cream. i am so glad u made this cake. i made one last year but it was too grainy…i shall try to make it ur way …i hope with success. I would enjoy this very much with a lovely cup of tea. Nice to hear from you Eva again. Good luck and please let me know. Cynthia, it would be great with a cup of hot tea. Ivy, can I come over for breakfast or for tea time tomorrow? It looks fantastic!!!!!! Nuria, usted es bienvenido cualquier momento. Bravo Hvi, you excel highly with your baking. I’ve never had “Kalon Prama”…I’ll see if my mom can it make it, as I’m a novice in baking. Thanks Peter but it’s so easy to make that I tell you give it a try, it’s not like other cakes which have to rise. Hi and thanks for stopping by. Hope you’ll visit again. PS Ivy. I have tagged you for a MEME. You are not obligated to carry it on of course, but check out my answers when you have the time!